Theatres often have a multi-functional use, where drama, cabaret, music and much more must be possible. It is important to design an acoustic environment that can fulfill all these demands. 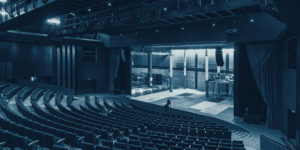 More and more, theatres are being built with variable acoustics using reflectors and movable panels. Besides that, the sound insulation towards the exterior has to be controlled, especially in dense urban areas.